With the lack of FireWire ports in the current MacBook ( ) and MacBook Air ( ), USB-only drives have re-emerged as attractive storage options for Mac users. The 500GB MiniStation TurboUSB Portable Hard Drive is a humble-looking workhorse of a drive, with modestly fast USB speed—if you're using Mac OS 10.4 (Tiger)—and the added security of being physically tougher than your average portable drive. The USB-only MiniStation is a durable little black brick. Equipped with a shock-resistant shell, it can survive more falls, drops, and bumps than your average drive, ensuring that your data remains safely stored inside. The few times I purposely dropped the drive from my desk to floor, the drive performed no worse for the wear. It's about as small as your standard external drive and its appearance is similarly benign, but the MiniStation allows for you to easily wrap up its cord for increased portability. The drive doesn't come with or need an AC power adapter; it can draw power from the USB connection. As a USB-only device with a 4,200 rpm hard drive mechanism, the MiniStation won't reach the data transfer speeds of drives equipped with FireWire or eSATA connections. It will, however, work on most current computers, although you will need the USB power adapter cord included with the drive in order to use it with older PowerBooks. While Buffalo's press materials tout increased connection speeds when using the included TurboUSB software driver, our test results showed otherwise when running Mac OS X 10.5 (Leopard). TurboUSB didn't make a difference in two of our three tests, with the duplication test being the one only to see any benefit. In our time trials, the MiniStation finished our 1GB copy test in approximately 52 seconds, with and without the TurboUSB driver. The low-memory Photoshop test was barely improved by the TurboUSB drivers; the average time of 1 minute and 37 seconds is in the realm of what we've seen from other external hard drives using USB. Our Duplication Test improved by 4 seconds when using the TurboUSB driver. Does this mean that TurboUSB is a bogus technology? Not necessarily. Buffalo says that the TurboUSB driver is meant for use with Mac OS 10.4, and that users who are running Leopard won't see a significant improvement in transfer speeds. We found that on a Mac running Tiger, the TurboUSB drivers will improve your scores dramatically. The MiniStation saw a 25 percent increase in our 1GB copy test, and a 20 percent boost in our duplication test, though even without the benefit of TurboUSB, our Leopard scores were higher across the board. 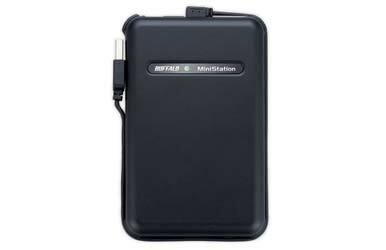 The MiniStation's 500GB capacity, though not unique, is the highest available for single-mechanism portable drives. Priced currently at $170, the Buffalo drive has a $0.34 cents per gigabyte ratio, besting even Toshiba's USB 2.0 Portable External Hard Drive 400GB ( ) $0.45 cents per gigabyte price. The MiniStation is also available in 320GB, 250GB, 160GB, and 120GB capacities. If you're looking for a USB-only drive, you could do a lot worse than the Buffalo MiniStation. The shock-resistant shell makes it better engineered for travel than competing drives, but its speed is underwhelming. Ultimately, though, if you're buying a USB-only drive, speed isn't as big a concern as safety, a convenient size, and portability—three features the MiniStation has in spades.